Burnt out cars are jack-knifed across cold, grey, concrete roads. Ransacked stores and abandoned homes lie empty and desolate. An unspecified apocalypse has destroyed almost all life on the planet, and the sky lours low and grey upon a wasted, cracking, dead landscape awash with acid rain. No country for old men? This is no country for anyone. 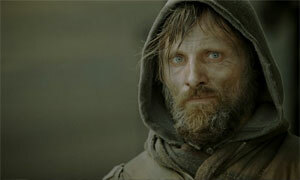 And yet across this bleak backdrop trudge two lonely figures, a father and son (Viggo Mortensen and Kodi Smit-McPhee). Their sole goal is to survive, as they head on a painful, pointless pilgrimage south. And with food scarce and grizzled gangs of tooled up cannibals scouring the landscape, rounding up anyone weak enough to stumble into their path, survival is no mean feat. If looking dog rough is a passport to an Oscar then Viggo is clearly a shoe-in for a gong. His emaciated frame caked in dirt an inch thick, a white-flecked beard bristling over this weather-beaten face, he gives the performance of a lifetime as the desperate father determined to do anything to keep his precious son alive. A nameless everyman, he is charged with keeping the fire of humanity alive, even if he can no longer tell the difference between bad and good in a world in which mankind has become its own worst enemy and no-one can be trusted – not so much dog eat dog as man eat man. Yet it’s the fragile, touching relationship between father and son that lies at the heart of this desolately bleak film and allows a slim ray of hope to pierce the darkness, suggesting that, as Philip Larkin so movingly put it, ‘what will survive of us is love’. The Road is not an easy ride, and you’ll need a strong heart and stomach to survive the ravages of the journey. There’s no cool Mad Max styling or black humour to lighten the load either: this is life at the sharp end, and it hurts. But that said, The Road is definitely a trip worth taking: haunting, nerve-wracking and utterly compelling, this is a film that will linger long in the mind and make you hold your loved ones just that big tighter.